Heat oven to 375°F. Place chicken, skin sides down, in ungreased rectangular pan, 13x9x2 inches. Mix remaining ingredients. Brush half of mayonnaise mixture over chicken. Cover and bake 30 minutes. Turn chicken; brush with remaining mayonnaise mixture. Bake uncovered about 30 minutes or until juice of chicken is no longer pink when centers of thickest pieces are cut. (If chicken begins to brown too quickly, cover with aluminum foil.) Discard any remaining mayonnaise mixture. 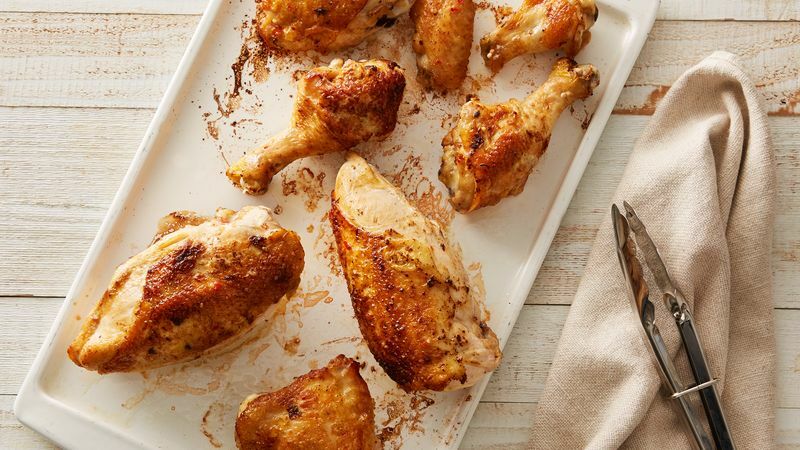 Brushing mayonnaise over the chicken produces a crisp, golden brown skin. However, using reduced-fat or fat-free mayonnaise won't work. Want to grill? You can make this recipe on the grill, too. Place the chicken, skin sides up, on the grill, and brush with half of the mayo mixture. Cover and grill 5 to 6 inches from medium heat 35 to 55 minutes, turning and brushing with remaining mayo mixture.